Colder temperatures and the beginning of snowfall in the winter season help provide the perfect environment to catch the local wildlife in Jackson and the greater Yellowstone area as they prepare for hibernation or seek warmer temperatures. Winter national park wildlife tours in Yellowstone and Grand Teton National Park provide an up close and personal viewing experience unlike any other as elk, moose, wolves, bears, bison, and other mammals all come down from the higher elevations seeking viable food sources and become more visible from the roadways and lower valleys with the transitioning seasons. 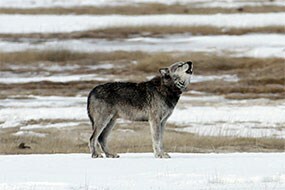 Wildlife tours can be most successful in the early morning or early evening when many animals are most active. Wildlife tours into Grand Teton National Park are, typically, a half day and Yellowstone Wildlife tours are, typically, a full-day. Check with your tour operator on meal options. Tour guides are knowledgeable on the regional history and local wildlife. Bring your best camera and come ready to experience the magic of learning about and witnessing the national park wildlife. The frigid air and snow-capped Tetons provide the perfect backdrop canvas as you explore areas like the Gros Ventre Wilderness, Togwotee Pass, Granite Hot Springs, the Bridger-Teton National Forest, and more on snowmobiles, fat bikes, and even via snowcoach. Snowcoach tours and snowmobile tours are the only authorized access on closed national park roads and trails in the winter. 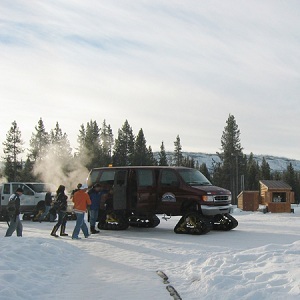 Snowcoach tours typically last the duration of the day while snowmobiling offers the choice of full or half-day tours. Check with your tour operator on meal options. Winter breathes new life into our local landscape and the adventure is only waiting for you to discover.